“A time will come when you will struggle and strive to have a glimpse of the edge of My robe” - this was what Swami had said decades ago when people would feel satiated at the number of padanamaskars they would be blessed with in a single session. Those were times when nobody ever believed that their beloved Swami could anytime become inaccessible. Swami is never inaccessible for He always resides in the depths of our hearts and is only a call away. But when we talk of His physical frame, those who are in Prashanti are witness to the Truth that is ringing in that statement that Swami made. Darshan has always been precious and Swami has oft told that the power of darshan should never be under estimated. “It is sought by the gods of the highest heavens!” - to put it in His own words. Familiarity, in this case, does not breed contempt but there is a high chance of it breeding neglect. And when darshans have got rarer by the day, devotees are flocking in far greater numbers and much greater intensity with the pining to see Him. And Swami seems to be drawing more as He is withdrawing more! It was in such a scenario that the alumni from the state of Tamil Nadu arrived to Prashanti Nilayam for their Prema Bandham, to rededicate themselves and their families at His lotus feet. At the very outset let us say that by Swami’s grace and the merit of their devotion, it turned out to be a wonderful and fulfilling experience. It was a Prema Bandham fest and the narrative ahead will more than sufficiently prove the case. 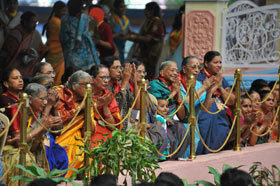 All the alumni with their families were seated in the Poornachandra auditorium. At 7:10 p.m., Swami arrived via the chair from the Yajur Mandir. Through the stage door, Swami entered the auditorium and He was escorted to the mini stage in the hall by a Veda chanting contingent. He came down the stage and accepted a few roses on the way. He cut two cakes before moving up the makeshift stage. Two children moved up the stage and took padanamaskar after offering roses to Him. Then, some of the alumni moved to Swami and presented to Him the different service activities that they had taken up. Blessing them, Swami asked for them to start their programme. They started with a song that had been composed and tuned by Swami Himself. It was in multiple languages and the theme of the song was, “Today is a very joyous day for we are with You.” This was followed by the all time classic, “Madhura Mohana”. Another song followed after which Swami said that He would go around blessing everyone. Swami began to move around. Everyone had been instructed that they should not fall at or touch His feet. And so, as Swami moved in their midst, letters were offered and a lucky few managed to share a few words with Him. Once again, a flashback - to those times when Swami would walk on the sands in the Nilayam coaxing the devotees to take padanamaskar. As recorded in some books, the devotees would ask, “How many times Swami? We have taken namaskar already today!” And that day, one would have to satisfy oneself just looking at those lovely lotus feet. Ah! Dear Lord! How much ever we get of You, we are never satisfied! We always want more of You for You are the goal of our life, nay our life itself. 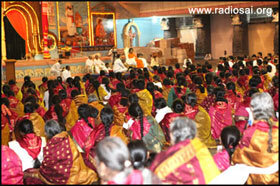 By 7:40 p.m., Swami had blessed all and had received aarthi in the auditorium. All the alumni and their families were so happy to have got such proximity in these times of scarcity. 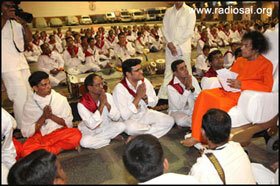 Swami meanwhile moved to the Sai Kulwant Hall where He granted darshan and sat for bhajans. 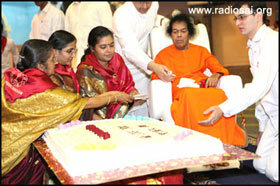 Of late times are such that it is only about three times a week that Swami comes on stage for bhajans. All those devotees who would make plans for a Puttaparthi visit lasting a day now ensure that their trip is a minimum three days for they do not want to leave without a darshan. And more devotees are flocking for His darshan. The Sai Kulwant Hall is full everyday even though the session gets delayed by as late as 8 p.m. as it happened that day. The Prema Bandham was a huge success in another way too. The Sunday turned out to be very special with Swami coming for darshan twice in a single day - something that is such a great blessing. As the members of the Prema Bandham (Chennai) sat singing bhajans, there were indications that Swami was arriving for morning darshan. It’s been more than a month since Swami has come for morning darshan and it has been a month since Swami has come for darshan on a Sunday! And so a Sunday morning darshan made the day sunny, lively and bright for all. 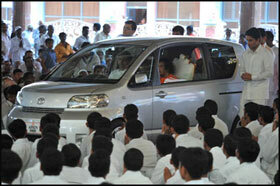 There was great joy as Swami arrived in the car and took a darshan round at 10:40 a.m. Arriving in the portico, Swami received aarthi and then taking another round of the gents, moved out. 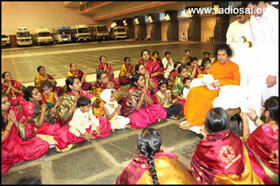 Through the town of Puttaparthi, Swami went to the Vidyagiri stadium. Ascending the hill, Swami went to the hanuman statue and there, hold your breath, came out of the car! Swami took a round in absolute privacy! It is such a rare thing for Swami. If we just ponder a while, we will realize that the way devotees throng and crowd around Him, the Sun God and the Wind God are justified in their complaint that they do not get His darshan at all! And that day they would have rejoiced. As the sun beams prostrated at His feet, it became a true Sunday! 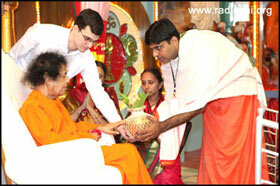 Soon, Swami returned to the residence. And as the members of Prema Bandham sat in the evening for their final session with Swami, they were to be blessed! 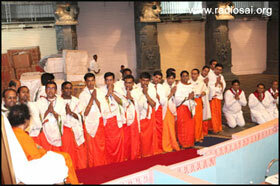 Swami arrived for the second time on the same day and at 7:05 p.m., took a complete darshan round. Coming on to the veranda, straight from the aisle at the gents' side, Swami moved into the Interview room for a short while, before emerging to glide past the upper veranda to come on to the dais at 7:20 p.m. En route, many earned His blessings and that included a group of higher secondary boys, seeking special blessings before the ensuing Board Exams. 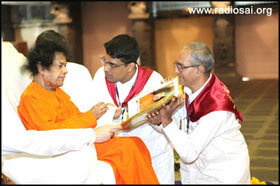 Swami blessed the pens and vibhuti prasadam, before coming onto the dais. 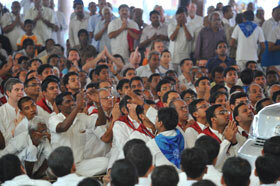 Arriving on the stage, Swami sat for more than 7-8 bhajans and the whole hall reverberated with the singing. 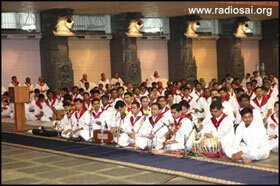 It was after almost a ten day break that all were witnessing a long and hearty bhajans session. 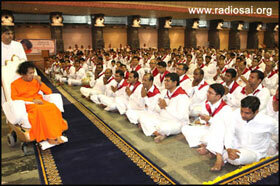 Swami also tapped His hands and moved His feet in rhythm with the bhajans. 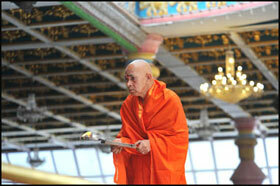 At 7:40 p.m., He received aarthi and retired for the day.